1. Middle East tinderbox. 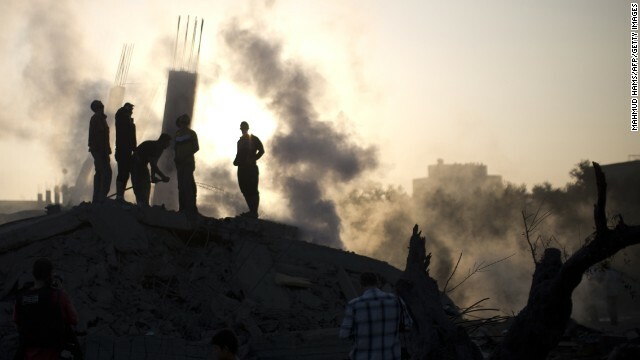 Israel's military launched a new round of airstrikes on Gaza in response to Hamas rocket attacks on Israel. The Israeli offensive has left at least 80 Palestinians dead, including women and children. So far no Israelis have been killed in the Hamas attacks. Secretary of State John Kerry says a cease-fire is desirable but unlikely until Hamas ceases its rocket assault. The latest Israeli-Palestinian clash was set off by last month's abduction and killing of three Israeli teenagers in the West Bank. Israel believes Hamas is responsible, although the group has denied any involvement. Last week a Palestinian was kidnapped and later found dead in Jerusalem in what Israeli police believe was a revenge killing. 2. Border crisis. President Obama is taking heat from Republicans and some Democrats for not visiting the Texas border where tens of thousands of unaccompanied children are entering the United States. Obama met with Gov. Rick Perry, R-Texas, as well as faith and business leaders during a stop in Dallas Wednesday. But Perry remained critical of the Obama after the meeting. "The American people expect to see their President when there is a disaster," Perry told CNN. "He showed up at Sandy. Why not Texas?" The President defended his decision not to visit the border, saying he's interested in solving the problem and not a "photo op." He said he asked Perry to help urge Republicans to approve the $3.7 billion in emergency funds he wants to deal with the crisis. Perry said he asked Obama to send National Guard troops to the border to deal with the surge, a request the President said he's willing to consider. 3. Germany kicks U.S. spy out. Germany has expelled the top U.S. intelligence official in that country over alleged spying of German officials. The incident is likely to exacerbate tensions between the two allies in a controversy that first surfaced in leaks from former NSA contractor Edward Snowden. Those leaks claimed that U.S. spying in Germany included taps on Chancellor Angela Merkel's cell phone. 4. Sarah Palin. The former Republican vice presidential candidate has a lot to say but a majority of Americans aren't interested in hearing her opinions. According to a new NBC/Wall Street Journal/Annenberg Public Policy Center of the University of Pennsylvania poll, 54% of people asked say they would prefer Palin be less outspoken about issues. That number includes nearly two-thirds of Democrats, a majority of independents and four out of 10 Republicans. Palin, who continues to be popular with Tea Party supporters, recently called for the impeachment of President Obama over his handling of the border crisis.